On Christmas Eve we will have two services. Games, prizes, contests, and more! Bring pie, sing, hear from God’s word, and enjoy each other! So our 8:45 service will FEEL like 9:45. Enjoy the extra hour of sleep! Youth Group meets at the church 6:30 each week. We hang out, play games, and hear from God's word. We end at 8:00 and parents can pick up from 8:00-8:30. Cornerstone is responsible for staffing Betty Lou’s Pantry in Coopersburg on September 8th and 22nd. Ten people are needed from 8:30 until 11:30am. This is a great time to meet some of our wonderful neighbors! Please contact Barry (610-972-0561) or Marlene (610-304-1491) Hoffman to help. There is a container in the church lobby to donate laundry detergent for the BLP clients. Youth group is starting up again! 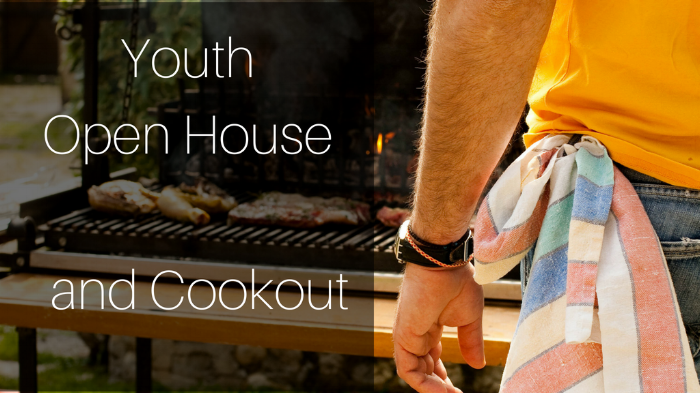 We'll kick things off with a cookout party on Sunday, Sept 9th from 6-9pm. Games, food, fun. In between services we will be kicking off the new school year of ministry at Cornerstone. Join us for food and fun! Happy Labor Day Weekend! Services will be at 8:45 and 11 am as usual. We are introducing a new song into Cornerstone's repertoire. Listen to it hear to learn it and teach it to your kids! We are having our first youth group open house! This is a chance for parents and families to see what the youth group is like. We are also inviting 5th graders who will be joining youth group next year. We'll make burgers and dogs--you bring drinks, desserts, and sides. We'll also have a time to meet the volunteers, hear plans for the next year, and hear what God has been doing in some of our lives. To end the night, we will play STUDENTS VS. ADULTS KICKBALL! Please RSVP by Wednesday, June 6 so we know how many to cook for. Parents and siblings of students 5th-12th grade are invited. Who: All community group leaders, officers, and men's/women's ministry leaders should attend. Bring your spouse if they want to come! Why: We want you to be equipped to lead your ministries well--and you are already doing a fantastic job. A couple times a year we want build relationships with one another and sharpen our shepherding skills. LEADERSHIP DEVELOPMENT will be our focus. How do we work toward raising up the next wave of leaders? Invite: Who are upcoming leaders in your group? Tell them you see potential in them and want them to come to this training. Forward this email so they can use the RSVP link. Childcare: We will have childcare available, let me know if you plan on bringing your kiddos. Worship will be at 8:45 and 11am as usual. Youth group will meet at 6:30pm at the church. Hope to see you there! Due to Snow the hunt in rescheduled for SATURDAY, MARCH 31st! Same time, same place, same fun! 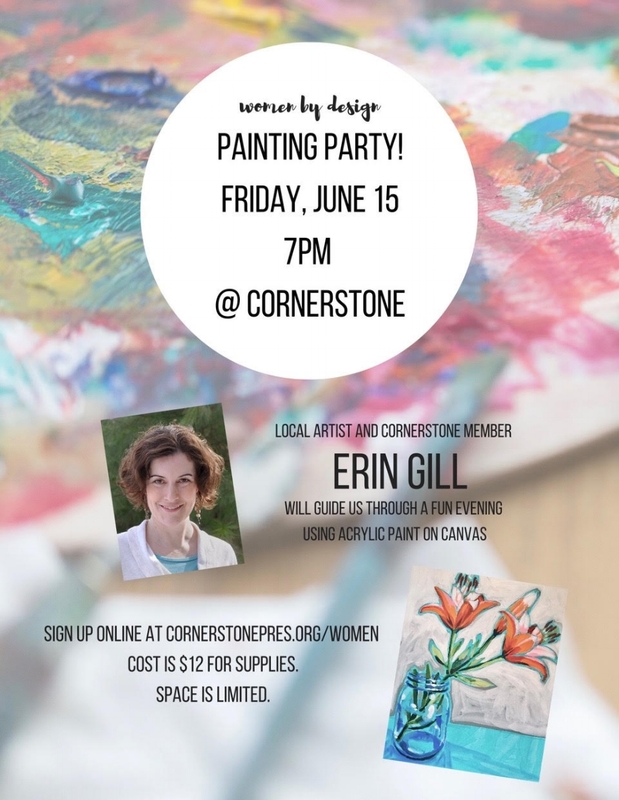 Email Lisa (lisa@cornerstonepres.org) for more details. Egg hunt is for children up to 5th grade, but all ages are welcome to come and hang out! The Lord brought Michael here last fall to minister to the students of Lehigh University as a part of RUF Lehigh and we are extremely thankful to have him as a part of our church body. Michael passed a series of tests on theology, Bible, church government, church history, Greek, Hebrew, and preaching and was approved by our Presbytery. This is quite an accomplishment! Clocks go forward 1 hour at 2am on Sunday morning to 3am. We will have service at regular time (8:45 and 11) but it will feel like an hour earlier! Due to the snow, we are cancelling the 8:45 service. We report our closings to WFMZ. The youth group will be offering a free children's program for parents who want to have a date night alone! Who: Infants to 5th graders. Older children will participate in all the activities, younger children will be in the nursery and participate is some activities. How: The youth group students and adult leaders will plan and run the night. What to bring: Please pack a “brown bag” dinner for your child that does not need to be microwaved. Due to allergies, please do not pack any nuts or nut products. Registration: Spots are limited and on a first come basis. 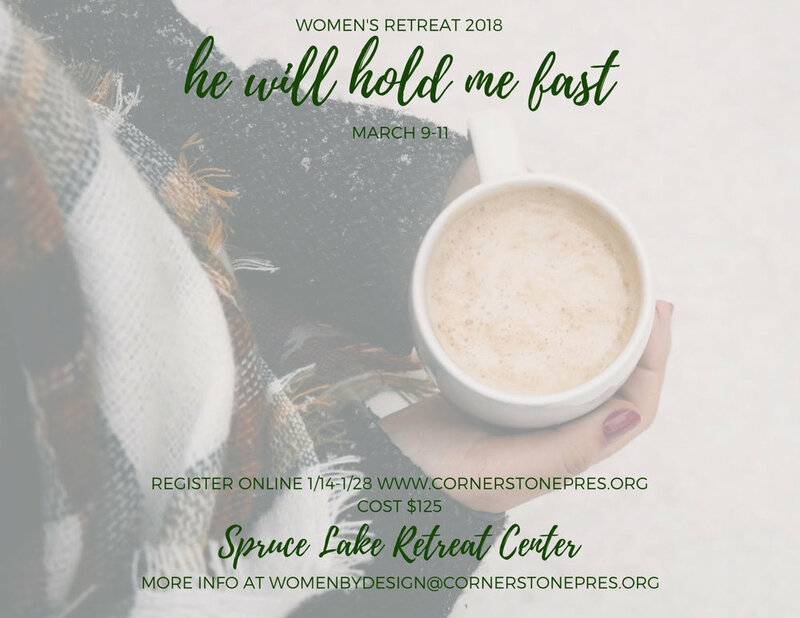 Registration closes February 4th. We can't wait to have a great night your kids! Questions or concerns? Email Nick Cirino at nick@cornerstonepres.org. In the morning we'll have our regular worship services. In the evening we will have two special Christmas Eve services. Gather with friends old and new and join in this festive evening of food and fellowship at the church. Bonnie Ridenour and Tracy Tyson will bring a special devotional message. The day before Thanksgiving we will meet for a special service where we thank God for his blessings to us. Afterward, bring your favorite pie and enjoy a little pre-holiday eating warm up! Thank you to everyone who attended our congregational meeting. It was our first meeting between services and we are thankful to the Lord to be able to give updates all all he is doing in our congregation. Below are the notes we handed out at the meeting. If you have any questions, contact a staff member or officer. Kendra Kammer will be our speaker and our theme is “Encounters With Grace”. We are returning to Spruce Lake and the cost is $140pp. Registration continues until Feb 12!